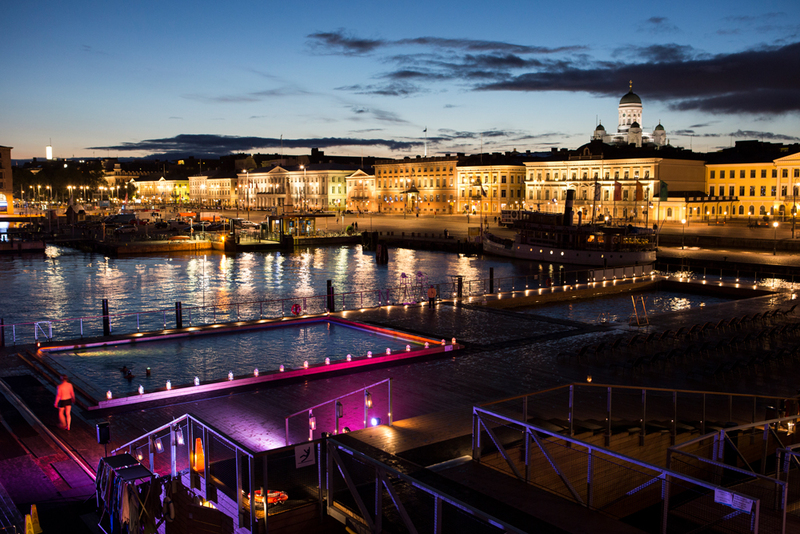 Located in the heart of Helsinki beside the famous market square, Allas Sea Pool combines traditional Finnish spa culture with modern urban life. The idea to turn a formerly fenced-off concrete area into an urban oasis dates back to 2013, with construction finally beginning in September 2015. The pools, saunas and cafeteria opened in late summer 2016, with a restaurant and other facilities following in 2017. The complex offers warm and cold pools enjoyed year-round by tourists and locals, young and old. 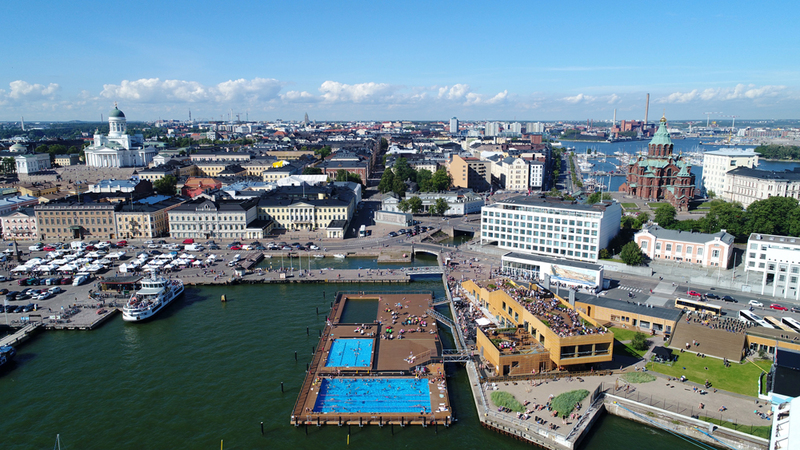 Allas Sea Pool is constructed from Finnish pine and consists of three swimming pools, three saunas, a terrace, cafeteria, restaurant, Baltic Sea Centre, Smart & Clean Showroom, ticket office, shop and changing rooms. Pools include a sea water pool, a warm water pool, and a children’s pool (summer only). Water for the sea water pool is pumped from cleaner currents farther out to sea (i.e. not from the harbour area) and filtered and treated using UV technique. The temperature remains equivalent to that of the Baltic Sea, making it possible to experience authentic Finnish ice swimming in the winter months. Both the warm pool and the children’s pool contain heated tap water. The pool platform has been built using several novel in-house innovations to improve safety, energy efficiency, pool technology, water purification and winter durability. 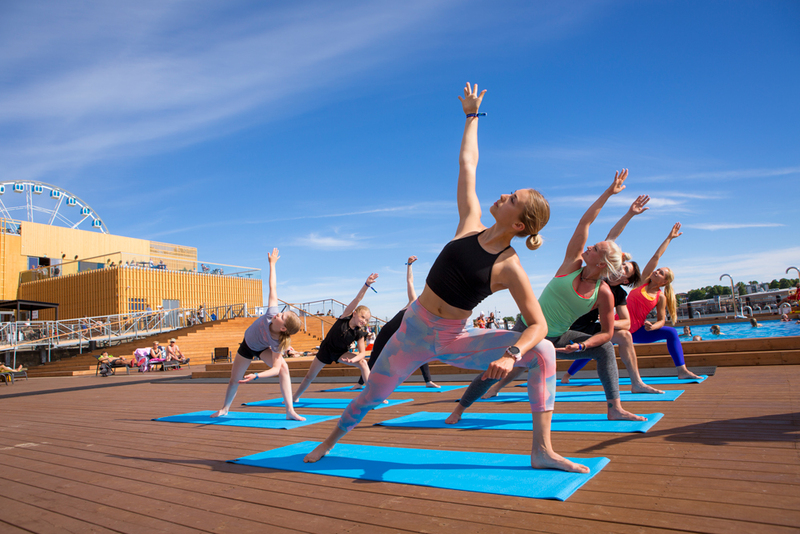 Three saunas (women’s, men’s and mixed-gender) offer the chance to relax and even participate in “sauna experiences” like Sauna Yoga or Finnish Wild Herb Sauna. The mixed sauna can also be booked for private events. 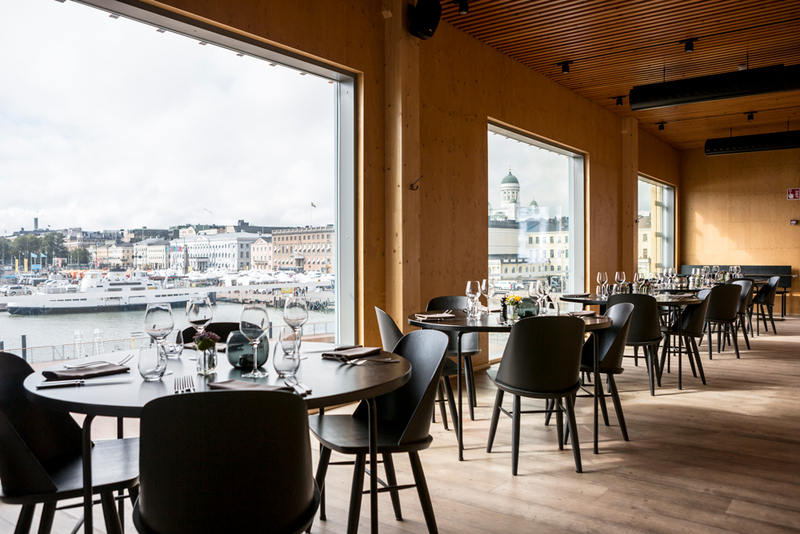 The 300-person capacity restaurant operates as a separate business, offering a locally inspired menu and views to the sea. During the summer, the rooftop terrace increases the capacity to almost 800 and often hosts events. The restaurant is open to the public without paying entry into the pool and sauna area. The Smart & Clean Showroom and Baltic Sea Center provide exhibition and event spaces. The Smart & Clean Showroom presents solutions for renewable energy, resource-efficient water and waste management, and ecological lifestyle solutions, while the Baltic Sea Center presents valuable information about the richness and the challenges of the Baltic Sea and hosts the largest public aquarium in Finland. Altogether, the Allas Sea Pool facility has a total area of almost 10 000 m² and a capacity of 3 500 persons. Based on the average visiting time, this equates to a potential 10 000 visitors per day! Allas Sea Pool provides benefits for multiple segments of the population. 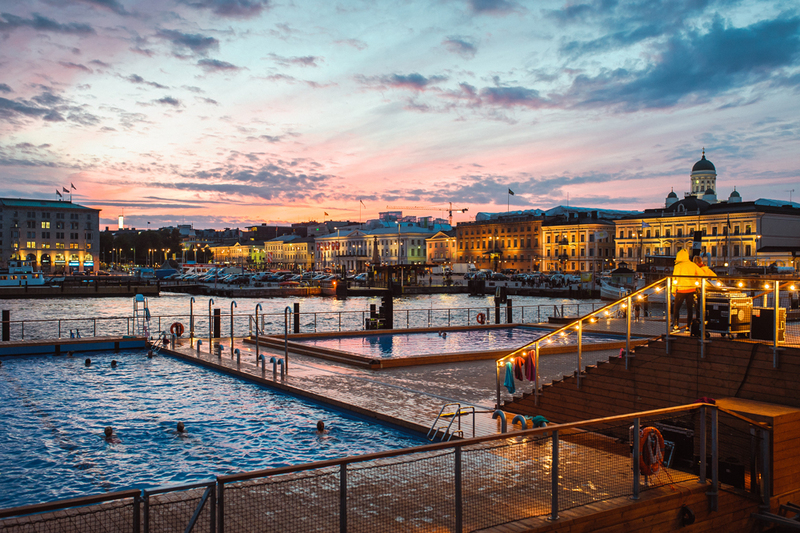 For tourists, the complex offers insight into Finnish spa culture, with the opportunity to participate in tailormade “sauna experiences” and sample local cuisine. Affordable entry prices and the multifunctional nature of the facility also make it a great place for locals to meet, exercise and relax. 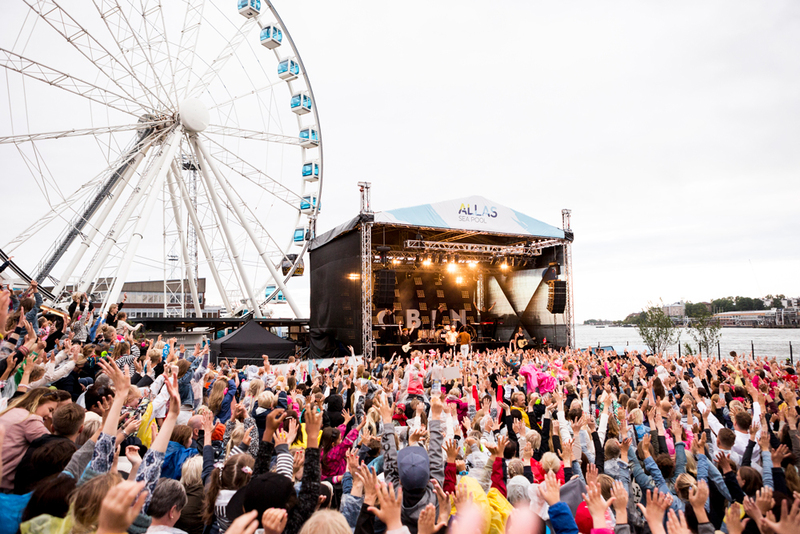 Visitor numbers have already exceeded expectations and the facility received the Helsinki Travel Award in October 2016. A final important outcome has been the new life that the complex has brought to a previously underutilised downtown location. 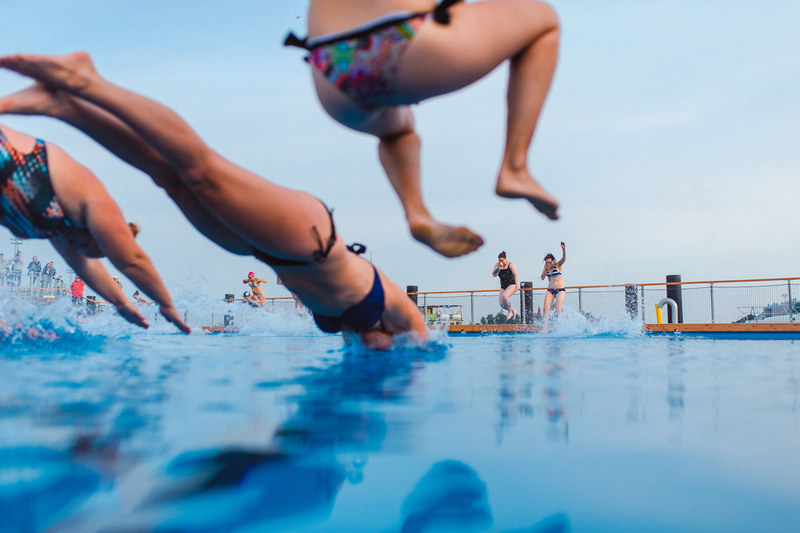 Allas Sea Pool is a great example of a project that combines tradition with a new type of exciting urban culture to bring benefits to a diverse range of visitors and locals alike. Key to success is the incorporation of many uses into a single facility. The facility also offers new solutions to transform waterfront areas previously not considered suitable for recreation. The incorporation of the Smart & Clean Showroom is particularly novel, offering great potential for new cleantech solutions to be developed in the future.